Nurse call systems are interwoven into the fabric of our lives. Almost dismissed as a given, they are quietly present in the hospital room as well as popular culture. But how did this communication evolve, and what is their role now as demands in the healthcare industry grows increasingly intricate? 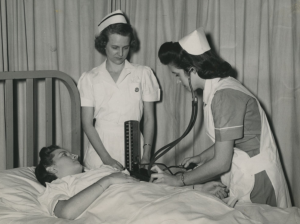 The Nurse call system was born in times of war. In this way it is not all that different from many advances in medicine. It was Crimean War of the 1850s where Florence Nightingale’s innovation to the art of nursing is the stuff of legend – One being the tinkle of a servant’s bell kept by a patient’s bedside in times of need. “Without a system of this kind, a nurse is converted to a pair of legs,” Nightingale famously said. Consider this the first analog nurse call system if you will. Low-tech perhaps, but efficient and reliable – cornerstones the most advanced systems still strive for today. Who can forget the gray, empty hospital corridors in “The Godfather” as Vito Corleone lay helpless? Set mid-century, the 1972 movie classic has many messages, but one can’t help but notice the utter lack of adequate nurse communication in that grim place, and all that could go wrong without it. Good thing Michael came by when he did! Soap operas flourished in the 1970s, with a medical facility always at the heart of the drama more often than not: “The Doctors”, “General Hospital”, and “Days of Our Lives” to name a few. Unnaturally attractive practitioners may have lead complicated lives, but those plot lines were often driven by the intercom calls and page tones that signaled action. Were they really all that different from Florence Nightingale’s bell? Medical dramas graduated to primetime in the decades that followed with “St. Elsewhere” 1980s, “E.R” in the 90s, and shows like “House” and “Grey’s Anatomy” ushering in the 21st Century. Art imitated life, and in doing so reflected the emergence of the nurse call communication technology in real time. It’s a different ballgame when it is you or a loved one is in the care facility. All the more true for medical staff and healthcare managers who rely upon these systems for sound operation of the facility and the lives entrusted in their charge. That’s where Intercall Systems come in. In the business for nearly half a century, this is the company is that largely wrote the script. Intercall Systems is local and family owned, based in Long Island New York. Intercall Systems is also very much an American success story. Grounded in this heritage, we take great pride that all manufacturing is, and always has been done here in the USA. The design and engineering of nurse call systems is what we do, and all we do, therefore the commitment shows in a superior product line.